Designation: Department, Imo State University. Citation: Nworgu KO (2018) The use of Advocacy Communication and Community Dialogue in Promoting of Exclusive Breastfeeding among Young Mothers in South -East, Nigeria. J Clin Case Rep Trials. Vol: 1, Issu: 1 (21- 29). Copyright: © 2018 Nworgu KO. This is an open-access article distributed under the terms of the Creative Commons Attribution License, which permits unrestricted use, distribution, and reproduction in any medium, provided the original author and source are credited. Advocacy and dialogue communication have become the medium through which social economic and political activities, development and civilization are expressed and feedback received. Dialogue and advocacy communication is very important in all aspect of our lives, it is crucial in the process of communal living. They no doubt serve as some of the most important avenues for educating, enlightening women in rural areas to participate vigorously in any social change programme. This study aimed at assessing the role of dialogue and advocacy in promoting and encouraging exclusive breastfeeding among young mothers in South -East, Nigeria. The researcher tried to find out if the women’s views and disposition on exclusive breastfeeding were influenced by advocacy communication and community dialogue strategies. The survey design was adopted .The study involved a sample size of 384 respondents drawn through simple random sampling technique from the five South-Eastern states. The questionnaire copies were distributed using research assistants. Findings show that community dialogue and advocacy communication helped in promoting exclusive breastfeeding practice young mothers in South-East, Nigeria. Such strategy gave room for immediate feedback through verbal response and non-verbal self-disclosure clues, thereby facilitating behavioral modifications and as well as empowering young mothers with regard to exclusive breastfeeding. The outcome of the study also show that women in South- East States get major information on breastfeeding information through health facilities during ante-natal and post-natal visits and also through group interactions in the communities through various women groups and meetings which is one of the channels of community dialogue and advocacy communication. It was recommended that effective and skillful use of interpersonal communication should be adopted as this is the fastest avenue of mobilizing or reaching the young mothers wherever they may be and there is the need for establishing communication between the young mothers and health experts in order to encourage grassroots women involvement and engagement in exclusive breast feeding. Community dialogue; Advocacy; Communication; Exclusive breastfeeding; Young mothers. African mothers have practiced breastfeeding of their infants from the time past. In Nigeria the use of breast milk as food for new born babies is an age long practice. However such breast feeding is complimented with water and later as the child grows is supplemented with some sorts of adult local foods. What may be new to young mothers in South- East is the idea of exclusively feeding of a child with only breast milk up to six months without water. This is why overtime, Nigeria has been regarded as having one of the poorest exclusive breastfeeding rates in Africa. Hence, only 13 percent of Nigerian infants are exclusively breastfed for six months . This may be as a result of ignorance and misinformation on exclusive breastfeeding among young mothers, resulting in the increase in infant mortality in the country . Exclusive breastfeeding is the weapon a child has to fight the onset of adult diseases and infections, based on the most costeffective source of reducing infant mortality and promoting a healthy childhood [3-7]. Exclusive breastfeeding is the practice of feeding only breast milk to a new born child and this allows the baby to receive vitamins, minerals, water, breast milk substitutes for first six months of the baby’s life [8,9]. Some cases women are more concerned with having a standing breast rather than feed their infants with such breast milk. Again wealth workers especially nurses and birth attendants encourage young not practice exclusive breastfeeding because of long held belief that a child cannot survive without water. Advocacy communication strategy, the other hand, is an adoptive process of gathering, organizing and formulating an idea to influence policy and decision makers to fight for social change. Dialogue, on the other hand, entails taking part in conversation or discussion in order to resolve a problem, in this case, breastfeeding issues. Exclusive breastfeeding awareness information is not only for the women alone [10,11]. Community dialogue and advocacy community involve everyone in the timing, place and strategies for passing the right information on breastfeeding that would be appreciated by the mothers, the family and the society at large. Community dialogue therefore is an essential part of promoting, protecting and supporting exclusive breastfeeding. We live in the world where individuals and communities connect across small and great distances at an instant notice through communication. According to Brownless , “new lines of communication are being created every day, and we have the ability to use these information channels to broaden our horizons and thus can spread breastfeeding information beyond our immediate time and place. This “dimension involve cross-generation, cross-sector, cross-gender and cross-culture communication and encourages and showing of knowledge and experience, thereby widening the outreach”. Also, the 2008 National Demographic Health Survey reported a significant drop in Nigeria’s exclusive breastfeeding rate from 17% in 2003 to 13%. The reason for the drop range from ignorance to traditional beliefs, one of which has to do with the use of water, as breast milk supplement. Scientific evidence shows that the child who is exclusively breastfed does not need additional water [13-18]. This is because breast milk itself contains 90% water, secondly, the child’s stomach is very small and when filled with water, the child is deprived of the much needed nutrients from breast milk, and thirdly, the child’s immune system is not fully developed to fight infections which emanate from giving water or other fluids from questionable sources. In Nigeria, while breastfeeding may be on the increase, the duration and practice of exclusive breastfeeding among women who had their delivery in a health facility and outside such facility, have remained low due to lack of education ; environmental factors [20,21] and age of the young mothers . The early introduction of complementary feeding, based on erroneous assumptions, affects breastfeeding initiation and sustainability. For instance among the Yoruba people South-west Nigeria, a common belief around infant feeding is that exclusive breastfeeding is beneficial to both infants and mothers, but complementary feeding is essential for babies to adapt to other meals with ease. Besides normative expectations, personal experiences and networks of support may have influence on the forms and quality of breastfeeding practices . Largely, these factors exert pressure on breastfeeding mothers thereby making their experience pleasurable or painful within time and space. Can community dialogue and advocacy communication be used to encourage young mothers to breast feed their infants? This is against the backdrop that young mothers may need information on exclusive breastfeeding practice. Hence, there may be the need for an effective means of encouraging exclusive breastfeeding by young mothers in South-East Nigeria. This is because as young mothers get more sophisticated, most infants are likely to be faced with the challenge of not being breast fed exclusively at birth time. Therefore, there may be the need for adequate information which could create awareness among young mothers on the importance of exclusive breastfeeding, especially since Nigeria is said to have one of the poorest exclusive breastfeeding rates in Africa. A situation whereby only a small percentage of children born in Nigeria are exclusively breastfed for six months, resulting in infant mortality and many early-life diseases requires intervention strategies. Therefore, young mothers may need some level of dialogue and adequate information through advocacy communication to be enlightened on the benefits of exclusive breastfeeding. This is based on the fact that breastfeeding reduces the mothers’ risk of fatal postpartum hemorrhage and premenopausal breast and ovarian cancer. Hence, health communication through advocacy and dialogue strategy are likely to be one of the best ways of passing the right information on exclusive breastfeeding that would be appreciated by mothers, their families and society at large. This is against the fact that the prevalence and duration of breast feeding may have declined in many parts of world, Nigeria inclusive for a number of social economic and cultural reasons . b) To identify the level of awareness created about the issue of exclusive breastfeeding among women. d) To ascertain whether the number of young mothers that engage in exclusive breastfeeding do so due to community dialogue and advocacy communication. RQ1 Do the women in South-east Nigeria engage in exclusive breastfeeding? RQ2 Do Women receive awareness information on exclusive breastfeeding? RQ3 What is the awareness level of the young mothers in South-East on the benefits of exclusive breastfeeding through community and advocacy communication? RQ4 Do young women in South- East Nigeria engage in exclusive breastfeeding due to dialogue & advocacy campaign programme? Exclusive breastfeeding based on the World Health Organization (WHO) definition, refers to the practice of feeding only breast milk (including expressed breast milk) which allows the baby to receive vitamins, minerals, medicine. Hence, water, breast milk substitutes, other liquids and solid foods are excluded. According to McGrath et al. “exclusive breastfeeding the baby is giving no other food or drink-not even water except breast milk”. It does however allow infant to receive oral rehydration salts (ORS) drops and syrups (vitamins, minerals and medicines). However, infants should be exclusively breastfed, receives only breast milk for the first six months of their lives to achieve optimal growth, development and health. Breast milk is the ideal food for the healthy growth and development of infants. Breastfeeding is also an integral part of the reproductive process with important implications for the health of mother. Hence, there is the need for mothers to breastfeed their babies within half an hour of delivery and to continue to breastfeed for at least six months [25,26]. At six months, complementary feeding should be introduced while continuing breastfeeding can last for two years on demand [27,28]. Therefore, “communication is an essential part of protecting, promoting and supporting breastfeeding. New lines of communication are being created every day and communities should have the ability to use these information channels to broaden their horizons and spread breastfeeding information beyond our immediate time and place to activate important dialogue”. Communication and advocacy for active involvement in protection, promotion and support of breastfeeding at all levels is important in order to increase the percentage of exclusively breastfed infants. Protection, promotion and support of breastfeeding is natural. It is also learned behavior. Taking a cursory look at the 2008 National Demographic Health Survey (NDHS), it will be noticed that there was a significant drop in Nigeria’s exclusive breastfeeding rate from 17% in 2003 to 13% with reasons ranging from ignorance to traditional beliefs. In a study on the determinants of exclusive breastfeeding in Nigeria at the school of Medicine, the University of Western Sydney, in collaboration with the University of Benin, Nigeria, it was discovered that exclusive breastfeeding (EBF) has important protective effect on the survival of infants and decreases risk of many life diseases. However, the exclusive breastfeeding rate in Nigeria was discovered to be low and falls well short of the expected levels needed to achieve a substantial reduction in infant mortality . Also, the study found that anti-natal care was strongly associated with an increased rate of exclusive breastfeeding. The researchers also stressed that appropriate infant feeding practices are needed if Nigeria is to reduce infant mortality from about 100 live births to a target of 35 deaths per 100 live births in the year 2015. It is also an established fact that exclusive breastfeeding for the first six months of life improves the growth, health and survival status of new born babies and is one of the most natural and best forms of preventive medicine for the child. The history of breastfeeding must have begun when the very first man and woman had their very first baby [30-32]. Breastfeeding practices and conceptions change with time [33-35]. Although nationwide efforts to promote exclusive breastfeeding began in Nigeria in 1992, World Health Organization/UNICEF recommendation in 1990 over the need to develop effective interventions to improve the rates of exclusive breastfeeding in Nigeria and thus reducing infant mortality. This led to the establishment of the baby-friendly hospital initiative (BFI) by the Nigerian government in Benin, Enugu, Maiduguri, Lagos, Jos and Port- Harcourt with the aim of providing mothers and their infant a supportive environment for breastfeeding and to promote exclusive breastfeeding, unfortunately, infant mortality have continued to be a major health issue affecting Nigeria. The infant mortality rate for the most recent five year period (1999-2003) is about 100 deaths per 1000 live births [36,37] and exclusive breastfeeding rates in Nigeria continue to fall well below the WHO/UNICEF recommendations of 90% exclusive breastfeeding of children for not less than six months in developing countries . The low rate of exclusive breastfeeding in Nigeria many in parts may be due to lack of information, beliefs, practices and rites [39,40]. For example in Yoruba, South-west and Benin South-South Nigeria exclusive breastfeeding is considered dangerous to the health of the infant who is thought to require water to quench thirst or stop his or her coughs. Also, because the majority of women deliver outside health facilities across the communities, it may be difficult to initiate community dialogue and provide information on exclusive breastfeeding. Mobilize human resources resulting in the improvement of exclusive breastfeeding among young women in South- East Nigeria. In addition, advocacy according to McGrath (1999) seeks for support, commitment and recognition from policy and decision-makers and the general public about an issue and the possible solution, thus placing and keeping exclusive breastfeeding issues on the public agenda. The World Health Organization (WHO) in conjunction with the World Alliance for Breastfeeding Action (WABA) and many other partners celebrate World breastfeeding week from 1st to 7th August every year. , the themes of the celebrations emphasize the importance of communication in protecting, promoting and supporting breastfeeding practice. Communication and advocacy for active involvement in protection and support of exclusive breastfeeding at all levels are important to increasing the percentage of exclusively breastfed infants. Currently, less than 40% of infants, less than six months of age, are exclusively breastfed worldwide. Protecting, promoting and supporting of breastfeeding are important because, even though breastfeeding is natural, it is also a learned behavior [48-51]. This decade provides one of the unprecedented opportunities for improving the health of women and children. In 2010, the UN Secretary General launched the Global Strategy for Women’s and children’s health aimed at saving 16 million women and children under five years of age in the 49 lowest income countries by 2015. The strategy is widely endorsed by governments and partners and over 40 billion dollars in commitments was made towards its implementation. This was accompanied by a framework for accountability that includes exclusive breastfeeding as one of eleven core indicators for tracking the process . Moreover, at the 63rd World Health Assembly held in May, 2010, a resolution was adopted on infant and young child nutrition which urged member states to strengthen and expedite the sustainable implementation of the global strategy for infant and young child feeding and implement plans of action to improve maternal, infant and young child nutrition [51,52]. To this effect, communication is key to attain such progress. Most themes for the world breastfeeding week highlight the opportunity of new communication technologies for making qualified support, accessible to health care providers, mothers and families. The World Health Organization has been working towards a broader use of various communication technologies for capacity building and access to updated information in many health related areas, including nutrition. Whereas, there is evidence that breastfeeding practices are improving in many developing countries,  and much more can be done especially in developing countries like Nigeria to harness the full benefits of community dialogue and advocacy communication on breastfeeding for children’s and women’s health . c) Identify individuals in the community considered to be credible, highly respected and cherished to carry your inoculation message for attitude change. d) Identify and play up the targets, psychological and psychographics characteristics likely to enhance or stimulate in them, the desire to change their original disposition towards the breastfeeding campaign. e) Provide measurable indices for realistic evaluation of what the attitude was prior to the breastfeeding programme, and what it is during and after the programme. This is one of the ways of measuring whether attitude change actually occurred and the extent, degree or magnitude of occurrence . This will also help communication practitioners, organizations/government to known the right adjustments to make their in overall breastfeeding programme development, implementation and evaluation plans. To further understand the importance of exclusive breastfeeding and its relevance to the survival of every child, the knowledge of the transfer model will unarguably be applicable to this study. It is at the core of public relations practices, which bother on transferring unfavourable disposition to favourable disposition. It is therefore anchored on changing people’s attitude from negative disposition to positive dispositions. Below is a graphic picture of the model, which will enhance a better understanding on how the model operates (Table 1). Table 1: Young mothers responses on their sources of exclusive breastfeeding information. The lesson derivable from the model as evident in the table is that community leaders, government or organizations should strive to convert people’s negative or unfavourable attitude indicators to positive or favourable attitude indicators (as shown in the Table 2). Collins et al. explains how community leaders or practitioners can use and apply PR tools and strategies through dialogue and advocacy towards changing hostility among organization’s target publics to sympathy so as to be in a better position to convert prejudice into acceptance, develop interest when there is apathy and then be able to communicate effectively to achieve knowledge where there is ignorance . Table 2: Responses on how often young mothers engage in discussion about exclusive breastfeeding. Applying this towards promoting exclusive breastfeeding among young women, community leaders, government, agencies can embark on continuous scanning of their immediate environments to know which negative attitude or combination of attitudes are building up among the community members towards exclusive breastfeeding such knowledge will help health workers design and execute appropriate breastfeeding programme to stop a growing negative attitude towards exclusive breastfeeding among young mothers [14,20-22]. Hence, prompt and realistic breastfeeding packaging and delivery of promotional messages can help immensely to transfer hostility to sympathy. Also, prejudice can be tackled through constant meetings with community leaders and stakeholders who because of the respect the command, could help the young mothers appreciate the need for exclusive breastfeeding. Attitude change advocacy communication. Through such forum as “August meeting” in the southeast, with massage on exclusive breastfeeding can be shared through community dialogue among participating women in the various communities. The problem of ignorance can be deadly if not properly managed. The major therapy to this is the use of multi-media approach to inform, educate and/or enlighten young women on the benefits of exclusive breastfeeding to a child. Successful transferring of ignorance to knowledge therefore requires such activities like frequent meeting with community leaders, young mothers and other stakeholders in the community; enlisting the support of town criers through the traditional leaders, organizing special events during which some misconception relating to exclusive breastfeeding can be discussed with community women leaders .In relation to this study, the model fits into community dialogue and advocacy communication which are maybe most beneficial in promoting exclusive breastfeeding among women. When such communication is effective, it paves way for development agencies and even the government to provide the appropriate and desired conditions to support exclusive breastfeeding campaigns among women who reside not only in the urban areas but also in the hinter lands. When proper message is created, women will in turn give the necessary co-operation needed to realize the main objective of exclusive breastfeeding programme. Survey research method was used for this study. This was chosen because it focused on a representative sample derived from the entire population of study. Survey research was used on the premise that the population is too large for us to effective observe all the elements. South-East Nigeria which was chosen as the population of study, has over 3 million young women, based on 2006 National Population Census. The researcher used one town each from the five states. Cursory observation shows great homogeneity and hetrogeneity in the population of the communities. The sample size was determined using a Table 3 Cozby (2004:130) at 95% confidence level. The sample size was 384 respondents. Simple random sampling technique was used. Also, purposive sampling was used to select only young mothers attending ante-natal and post-natal in governmentowned health centres. Table 3: Assessment to know the awareness level of exclusive breastfeeding. Using a quota and simple random methods a sample was drawn from two medical centers in each state. The primary data included information derived from oral interviews and questionnaire questions, while the secondary data came from public journals and textbooks on breastfeeding. The instrument for data collection was the questionnaire which was structured into and contained the demographic and psychographic questions. Face validity was used to ascertain that instrument measures what it was expected to measure, while pre-test was used to ensure reliability of the instrument. Questionnaire copies were administered by the research assistants in two medical facilities in the five South- East states of Anambra, Abia, Ebonyi, Enugu and Imo. Therefore, respondents filled out the questionnaire copies at the point they were given. This minimized non-response rate and increased the chances of the study achieving its objectives. For data presentation and analysis, the researcher used of frequency (Table 4), simple percentages and charts. Table 4: Assessment on whether young mothers engage in exclusive breastfeeding due to community dialogue and advocacy communication. RQ1: How do young mothers receive information on exclusive breastfeeding? The question was asked to gather data on the medium through which young mothers do you receive the information about exclusive breastfeeding? Based on the results, the majority of the respondents (41.9%) indicated they receive information on exclusive breastfeeding through health care centres breastfeeding information, 40% of the respondents indicated that their source of information regarding breastfeeding was through public enlightenment programme, while (17.9%) respondents indicated that they receive such information through women groups. This means that greater percentage of the respondents get their source of exclusive breastfeeding were through health care workers, at the health centres public enlightenment programmes and women groups, The result indicated that young mothers in of South-East Nigeria are informed on exclusive breastfeeding through advocacy communication (Figure 1). Young mothers responses on their sources of exclusive breastfeeding information. Figure 1: Young mothers responses on their sources of exclusive breastfeeding information. RQ2: Do Young mothers engage in discussion about exclusive breastfeeding? Data presented in the Figure 2 and Table 2 provided answers to research question two. Hence, 72.9% of the respondents indicated that they very often discuss exclusive breastfeeding issues with women in their locality, 7.3% indicated that often, held discussion on the issue, 13.2% of the respondents indicated that they rare held discussion on the issue, while 5.98% of the respondents indicated very rare. This means that the greater percentage of the respondents indicated that they engage in discussion about exclusive breastfeeding for their infants. This means that the greater percentage of the respondents engage in discussion on exclusive breastfeeding issues (Figure 2). Responses on how often young mothers engage in discussion about exclusive breastfeeding. Figure 2: Responses on how often young mothers engage in discussion about exclusive breastfeeding. RQ3: What is the awareness level of Young Mothers in South-East on the Benefits of Exclusive breastfeeding? Data presented in the Table 3 was used to answer the research question three. Therefore, 79.9% indicated that there is high awareness level on exclusive breastfeeding, 14.06% indicated that there is low awareness level; while 5.98% indicated there was no awareness on exclusive breastfeeding. 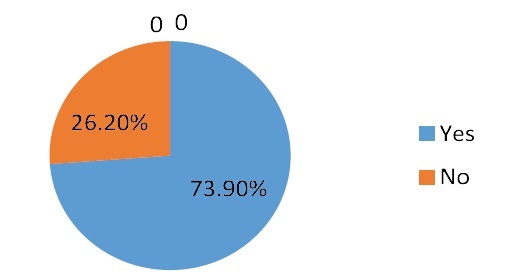 This means that a greater percentage of respondents indicated that the awareness level on exclusive breastfeeding is high based on discussions they hold on the issue (Figure 3). Assessment to know the awareness level of exclusive breastfeeding. Figure 3: Assessment to know the awareness level of exclusive breastfeeding. Data presented in the chart4 indicated that 73.9% of the respondents noted that they engage in exclusive breastfeeding due to community dialogue and advocacy communication on the issue. While 26.2% indicated that they engage in exclusive breastfeeding not based on the community dialogue & advocacy campaigns about the practice. 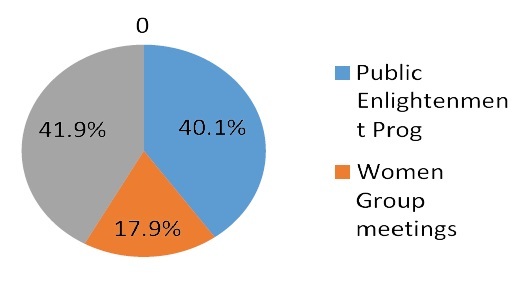 This means that the greater percentage of the respondents are engage in the exclusive breastfeeding due to advocacy and dialogue on the subject (Figure 4). Assessment on whether young mothers engage in exclusive breastfeeding due to community dialogue and advocacy communication. Figure 4: Assessment on whether young mothers engage in exclusive breastfeeding due to community dialogue and advocacy communication. The research was designed to find out whether the respondents get awareness message or receive exclusive breastfeeding information through community dialogue and advocacy communication. Based on the findings, the majority of the respondents indicated that they receive exclusive breastfeeding awareness messages through antenatal and post-natal sessions in hospitals. It is noteworthy that each of selected community has a different health care centres as a way of sharing meaning and experiences that will be championing exclusive breastfeeding campaign [7,15,28]. The second research question sought to know whether the respondents engage in discussions on exclusive breastfeeding in order to enhance the use of community dialogue and advocacy communication. It is gathered that the majority of the respondents are of the view that there is high level of awareness on exclusive breastfeeding is made possible through discussion with other women and women groups. Young mothers and exclusive breastfeeding. This is why Morrison (1998:125) in his study on Burkinable griots, suggested oral communication as a powerful tool for development. He further found out that the group (Women group), use stories, tales, proverbs, powerful words which form part of their collective consciousness and have contributed in passing messages of development to the women. To get women in rural communities and Nigeria at large to participate in development programmes and activities including exclusive breastfeeding practice, may require a one-on-one approach, using the benefits derivable from such social, cultural, economic and political endeavours. It is only by interactive communication through dialogue and advocacy process that people feel very free to react or respond to issues based on their individual feelings about a message. When this is the case, it becomes easier to decode a particular message and also convince to participants to take action, especially, towards exclusive breastfeeding campaign. To this effect, the respondents were asked if there was any breastfeeding programme in their area. The majority of the respondents were of the view that there was exclusive breastfeeding campaign is going on at all health centres in South-East, Nigeria. This is in line with the assertion of different that exclusive breastfeeding is the way to go [51,52]. Also, the respondents were asked what is the awareness level of exclusive breastfeeding in South-East Nigeria the majority of the respondents were of the opinion that the awareness level on exclusive breastfeeding is very high and the majority of them agreed that they engage in exclusive breastfeeding discussion among each other adding that most people, especially, women in South-East, Nigeria are predominantly illiterates, hence dialogue and advocacy through interactive channels of communication become very effective in a order to provide adequate information about exclusive breastfeeding. Advocacy communication and communication Dialogue and exclusive breastfeeding. Therefore, advocacy communication and community dialogue have played a vital role in the development of nations both at community, individual and human levels. African societies are largely dependent on oral communication. The use of advocacy and dialogue appears to be an inevitable communication approach in empowering women on exclusive breastfeeding. To get these women in South-East Nigeria participate fully in such programmes as exclusive breastfeeding and other initiatives will entail one-on-one communication based on perceived benefits derivable from such social, cultural, economic and political activity. It is only in community dialogue and advocacy through interactive communication that people feel very free to react or respond based on their individual feelings about a message. When this is the case, it becomes easier to package exclusive breastfeeding message and elicit participation from the young mothers. This study therefore tried to assess the role of community dialogue and advocacy communication in promoting exclusive breastfeeding practice in South-East Nigeria. Invariably, any empowerment programme that does not emphasize community dialogue and advocacy communication may not be effectively realized. Since access and the use of modern mass media are low and illiteracy level is still high in Nigeria. Finally, it was discovered that women in South-East Nigeria indicated that they get major breastfeeding information through health care centers, and women group other than any other sources. It follows, therefore, that women in South-East Nigeria can be targeted for breastfeeding campaign through women group meetings which is a form of inter-personal communication approach. The majority of the young mothers in South-East Nigeria get breastfeeding information through health centres and women-meeting groups; that advocacy communication and community dialogue through, interpersonal communication can help in promoting exclusive breastfeeding practice among women in the rural communities and semi urban areas; That women in South-East Nigeria engage in breastfeeding issues and discussion during the village women’s association meetings which are forms of community dialogue. That a well-coordinated and planned breastfeeding campaign programme by the government advocacy communication will bring about massive acceptance of exclusive breastfeeding practice to the communities and the nation at large. Community dialogue and advocacy communication through group communication be used as very effective means of empowering the women living in both the urban and rural areas for exclusive breastfeeding initiative. Hence, dialogue and advocacy communication are the backbone of rural empowerment, especially, as it concerns women living in rural areas. When used constantly, dialogue and advocacy communication can help change attitude that will promote the acceptance of exclusive breastfeeding practice; we therefore observe that no meaningful programme at rural areas can succeed without involving dialogue and advocacy communication. Hence, the unique qualities and elements of dialogue and advocacy enhance communication circles. Effective and skillful use of community dialogue and advocacy communication through group and interpersonal communication, which is an integral part of traditional communication, should be adopted. This remains the fastest avenue of mobilizing or reaching the target audience (rural women) wherever they may be. It will also help in and establishing communication between the end-users of development programmes and those who package these programmes. This should be the essence of grassroots (women) involvement in exclusive breastfeeding campaigns.